You may want to dry flowers to preserve a memory, or to make a dried flower arrangement to display in your house. Once you dry your flowers, you will want to preserve them. 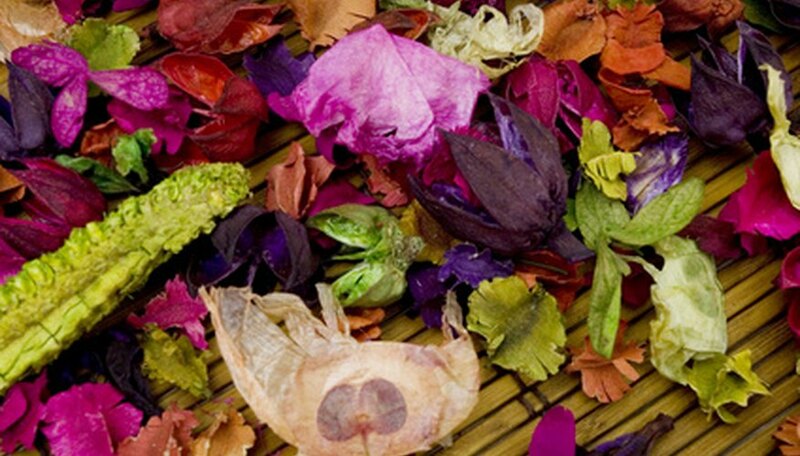 Dried flowers are brittle, and can break apart quite easily. This is fine if you plan on making potpourri, but not if you want to keep your flowers intact. Preserving them will keep them from harm so that you can admire them for a long time. Lay a sheet of newspaper over your counter, and place the dried flowers on top of it. Spray the flowers with a light coating of hairspray. Turn the flowers over to get all four sides. Let the hairspray dry on the dried flowers before you pick them up to use them. Put on a mask and a pair of plastic gloves. This is for your protection when you work with the liquid plastic. Mix the liquid plastic (also called craft resin) with a hardening agent. Follow all of the instructions on the product label. Pour 1/4 inch of the liquid plastic into a latex rubber mold. Allow it to set. This information will be on the product label and will either be 15 or 30 minutes. Set the dried flower over the first layer of liquid plastic. Then add another 1/4 inch of liquid plastic over the dried flower. Let it set. Keep adding 1/4 inch layers of liquid plastic to the mold until it is full. Once the last layer sets, you can pop the dried flower preserved in liquid plastic out, and display it. Make sure you use the liquid plastic in a well-ventilated area.